I joined House Republicans in launching our #GoodJobs4PA initiative this week, focusing on efforts to enhance our workforce development system to help students, under-employed and unemployed adults, as well as returning military veterans and others enter fulfilling, family-sustaining careers. The bills aim to address the skills gap and worker shortages faced by industries across the state, as well as enhance educational programs and access to those opportunities for workers of all ages. The launch coincided with the governor signing an executive order to create the Keystone Economic Development and Workforce Command Center. The center is charged with addressing barriers to employment and enhancing cooperation among education and workforce development entities. 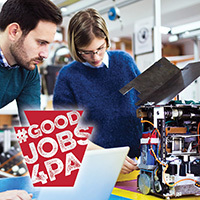 As a foundational part of the #GoodJobs4PA initiative, the House Education Committee unveiled a package of bills aimed at improving career and technical education (CTE) in Pennsylvania. • House Bill 265, which would expand the online database that allows students and potential students to plan where courses, programs, certificates and diplomas transfer among public schools and institutions of higher education. • House Bill 297, which would direct the State Department of Education to develop materials outlining workforce needs, including training opportunities and future earning potential. • House Bill 334, which would expedite the approval of important educational programs to respond better to industry and workforce demands. • House Bill 393 (to be introduced soon), which would create an online career resource center. • House Bill 394 (to be introduced soon), which would require the Pennsylvania Department of Education to inventory workforce development programs offered at secondary and postsecondary institutions. • House Bill 395 (to be introduced soon), which would require CTE programs to establish occupational advisory committees. • House Bill 396 (to be introduced soon), which would add at least one member from a Career and Technical Center to each Workforce Development Board. • House Bill 522, which would create a CTE investment incentive program, including tax credits for contributions to support CTE programs and enrollment expansion programs. These bills are designed to increase awareness of job-training opportunities and high-demand careers for students. 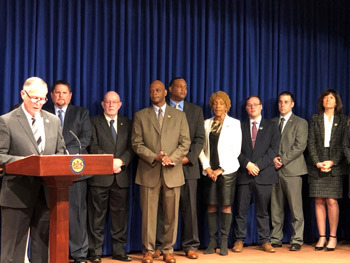 Seeking to prevent a health care crisis in Pennsylvania, physicians, administrators, attorneys and industry professionals told members of the House Majority Policy Committee last week that the Pennsylvania Supreme Court should not change a rule dealing with medical malpractice lawsuits. Shortly after the hearing concluded, the Supreme Court decided to postpone its consideration until a study on the impact of the rule change is conducted later this year. The pending proposal would reverse a rule that requires malpractice cases be brought in the county where the malpractice occurred, thereby prohibiting “shopping” for venues, such as Philadelphia, where jury awards tend to be higher. Reversing the rule would also reverse progress that has been made to ensure access for all Pennsylvanians, regardless of ZIP code, to quality health care. Prior to the rule’s implementation, skyrocketing malpractice insurance rates were forcing many doctors and specialists to retire early or move their practices out of state. Rural areas were hit especially hard, and a reversal of this rule could again put health care into a crisis situation. Helping Pennsylvanians cut down on the number of telemarketing calls they receive is the goal of House Bill 318, which was passed this week. The bill gives Pennsylvanians the ability to sign up for the state’s telemarketing "do-not-call" list without requiring them to re-register every five years. The bill also aims to cut down on the annoyance of telemarketing calls during holidays by banning telemarketing calls on legal holidays. It would also ban the use of calls from computerized auto-dialers (robocalls).